The Scottish Exhibition of National History, Art and Industry was held in Glasgow in 1911. It was the third of 4 international exhibitions held in Glasgow, Scotland during the late 19th and early 20th centuries. A menu from Miss Cranston's tea room at the exhibition. 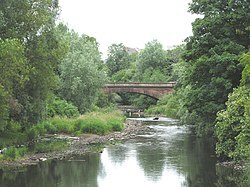 Kelvin river running through the site of the exhibition. The exhibition followed the lead of the previous two exhibitions (Glaswegian exhibition (1888) and Glasgow International Exhibition (1901)) and took place at Kelvingrove Park. It ran from 2 May to 4 November 1911, and recorded over 9.3 million visits. The fair was held close to the River Kelvin structured around the Stewart Memorial and included a Palace of History (based on the Falkland Palace, a Palace of Industry, Concert Hall and an Aviation Building. Entertainments included boat trips, an aerial railway and a Highland Village (from which a cairn marking the village remains). The land used is now a park. Profits from the fair were used to fund the establishment of a Chair of Scottish History and Literature at the University of Glasgow the post was originally filled by Robert Rait and is now occupied by Edward J. Cowan. ^ "THE SCOTTISH EXHIBITION OF HISTORY, ART AND INDUSTRY - GLASGOW 1911". Retrieved 12 March 2011. ^ "University of Glasgow :: Story :: Biography of Scottish Exhibition of National History, Art and Industry". Retrieved 12 March 2011. ^ "Glasgow Exhibition 1911". Retrieved 12 March 2011. ^ "Kelvingrove Park Heritage Trail 21-24". Retrieved 12 March 2011.